Start your day on your private lanai watching the sunrise and listening to the sounds of our many tropical birds. Enjoy a stroll to a clear mountain pool at the bottom of a nearby waterfall. Stop along the way to pick and enjoy a selection of tropical fruits, flowers or macadamia nuts from our many trees. Hiking trails through area forest reserves of Paperbark, Norfolk Pine, and Kukui Nut trees and a spectacular view of Kauai's Sunny South Side are right out your back door. Or you might choose to relax with a book on a hammock surrounded by tropical gardens. After taking in Kauai's many attractions, experience our magnificent sunsets from your lanai before enjoying dinner at one of many fine nearby restaurants. We are more than willing to help you enjoy your Kauai experience but we also respect your privacy. Children are welcome and will enjoy our play yard and selection of toys and videos. We are convenient to many island attractions, 20 minutes from the airport, 10 minutes to beautiful beaches and snorkeling, 20 minutes to Waive and a scenic drive to Kauai's lush North Shore. 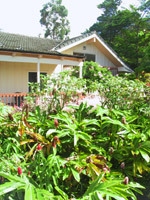 Volcanoes National Park Hotels offers great rates on over 50 hotels near Volcanoes National Park on Hawaii's Big Island. Airport Parking Birmingham - Choose from several car parking options at Birmingham International airport. Get online quotes and full car park details such as arrival procedures and security measures in place. Instant online email parking vouchers with full directions. Hawaii Visitors & Convention Bureau - Kauai Visitors Bureau - Poipu Beach Resort Assoc.